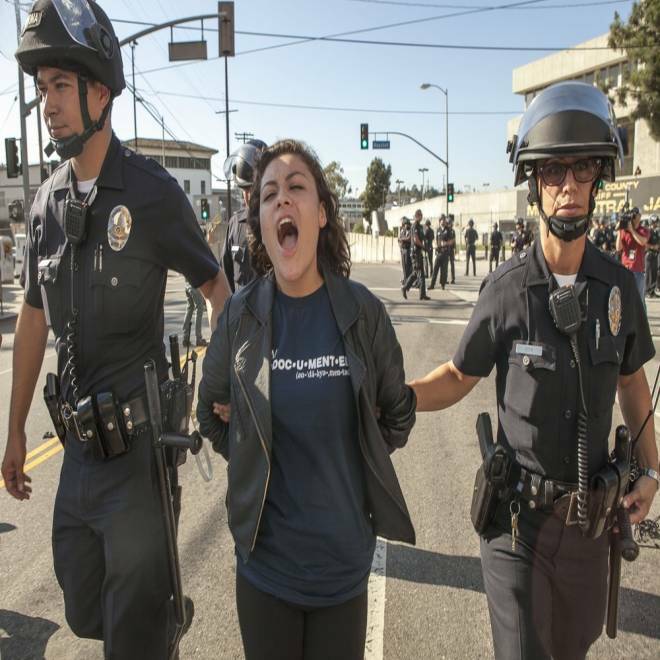 High school student Claudia Rueda, 17, center, is arrested by Los Angeles Police officers for failing to disperse, as protesters blocked the intersection of the Los Angeles Sheriff's Department Twin Tower Correctional Facility in Los Angeles Thursday, Sept. 6, 2012. Students demanded the passage of Assembly Bill 1081, also known as the Trust Act. California’s governor has vetoed a bill that would have allowed police and sheriffs to free undocumented immigrants from custody once they became eligible for release even if federal immigration authorities had asked to hold them for possible deportation proceedings. Immigration advocates say the federal requests, known as detainers or holds, cast a wide dragnet that has ensnared even those who had committed minor crimes or no offenses at all. But Immigration and Customs Enforcement had said the program was instrumental in helping enforce immigration laws and in getting violent offenders off the streets. In his veto message late Sunday, Gov. Edmund G. Brown Jr. said he could not sign the bill because under it, “local officers would be prohibited from complying with an immigration detainer unless the person arrested was charged with, or has been previously convicted of, a serious or violent felony. Brown noted he would work with lawmakers to improve the legislation and said undocumented immigrants “play a major role in California's economy, with many performing low-wage jobs that others don't want. Immigration activists denounced Brown’s veto, comparing it to Arizona’s controversial immigration law that includes a provision forcing those stopped by police to show their immigration papers. "By vetoing the Trust Act Governor Brown has failed California's immigrant communities, imperiling civil rights and leaving us all less safe. The President's disastrous Secure Communities program is replicating Arizona's model of immigration enforcement nationally, causing a human rights crisis. Immigration and Customs Enforcement strong-armed the Governor to defend its deportation quota instead of defending Californian's rights,” Pablo Alvarado, executive director of the National Day Laborer Organizing Network, said in a statement. “On this sad day, we renew our commitment to fight to keep our families together despite the Governor and the President's insistence on seeing them torn apart." Alvarado was referring to ICE’s “Secure Communities” program, under which the FBI shares fingerprints of those arrested with federal immigration authorities who check to see if the person is not legally in the U.S. or if they can be deported due to a criminal conviction. In a statement last week, ICE Deputy Press Secretary Gillian Christensen said the agency didn’t comment on pending state legislation. “The federal government alone sets these priorities and places detainers on individuals arrested on criminal charges to ensure that dangerous criminal aliens and other priority individuals are not released from prisons and jails into our communities,” she added. Assemblymember Tom Ammiano, a San Francisco Democrat who sponsored the legislation, said late Monday that the California State Sheriff's Association, which had opposed the bill, called his office on Monday to negotiate on the issue, which he took as a "good sign." "Governors come and go, you know, but this issue is more than a political issue, it is a movement," he said. Some immigration rights' activists took Brown to task for also vetoing a bill requiring the creation of state regulations governing the working conditions of domestic workers but instead signing off on legislation that would allow some undocumented youth to get a driver's license. It is intended for those who qualify for the federal government's deferred action policy, which provides a two-year work permit and a reprieve from deportation for those who were brought to the U.S. as children. There are some 300,000 youth in California who are currently eligible for the policy, according to the Immigration Policy Center. “Brown waited until the 11th hour of his legislative cycle to … veto the most important and impactful bills that would have (brought) tremendous relief for the immigrant community in California and instead decided to sign a very symbolic and hollow bill,” Carlos Amador, of immigrant rights' group Dream Team Los Angeles, told NBC News by phone. But Assemblymember Gilbert Cedillo, a Democrat from Los Angeles who introduced the driver’s license bill, said he’d received many messages from those who were elated by the passage of the law.